First, here is a question. What happens when you have "Wreckless," "Irresponsible" AND "Knot Guilty" (Willson Jenkins, a lawyer) on the race course at one time?! I leave it to your imagination!! Well, I don't know what happened, but I totally dropped the blogging ball after Saturday morning, resulting in zero information about the regatta at all!! Things did look doubtful, but we all piled in our boats and headed to the course, where the wind mamby-pambied around for a while; here, then gone, then here again. That gave the race committee fits, but finally they decided there was enough wind to race. That first race became painfully streaky at points and was one of those races that was very unpredictable. Still, it was a race! Plus, the wind picked up a bit after that. I'm not saying we were hiking or anything, but we were all moving and the wind was fairly consistent. So we got the desired four races in on Saturday, which, based on what we saw in the morning, was a miracle. Ben and I were feeling pretty darn good, too. We'd had some really good finishes, including a second place (behind Jeff and Amy Linton, 2012 North American champions among other things, so that's practically a first place! ), and the other finishes were pretty high also. It was only after dinner, when we went to check the standings, that we discovered we'd been OCS (on course side, ie over the line) in TWO races! Ugh. That's a first. What we "learned" this regatta, numbers (any numbers!!) are better than letters! Still, we had a great time. The total number of, not just out of town, but out of district boats, was a real testament to how much traveling race organizer John Kreidler has done over the years. One day we'll get him up to the Glow in the Dark!! 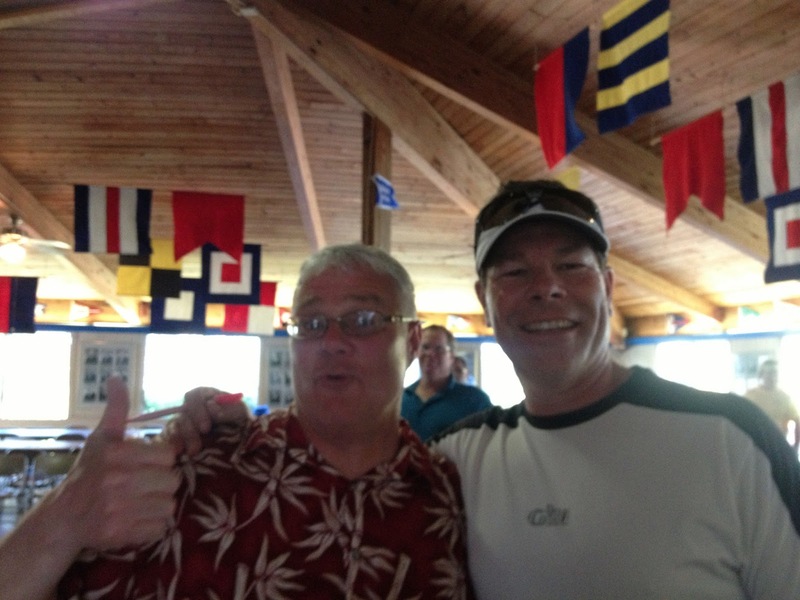 Here is John with Ben in Lake Hartwell's really really nice clubhouse. Sunday was a bit more of the same, with light winds but it looked promising. At one point Ben and I were both on the high side! That was great for four of the five legs, at which point the wind completely died, the water was like glass. ... need I say more?! Anyway, that was it for racing, and we all congregated back at the clubhouse for a nice lunch and trophy presentation. Winning skipper Jeff Linton made a point to note how much traveling John Kreidler has been doing and strongly urged others in the Dixie Lakes District to do the same. Amen! !